The college-football season is in full swing, and the team at Pac-12 Networks (P12N) is already making some history, taking its Saturday-morning kickoff show The Pregame on the road for the very first time — and using its signature at-home production model to do so. Although a show like ESPN’s College Gameday, one of the industry’s largest weekly productions, is practically a traveling concert, P12N was looking to implement a sleek operation that would allow the freedom and flexibility to take the show to each of the conference’s 12 member institutions and also broadcast from unique locations on those campuses. 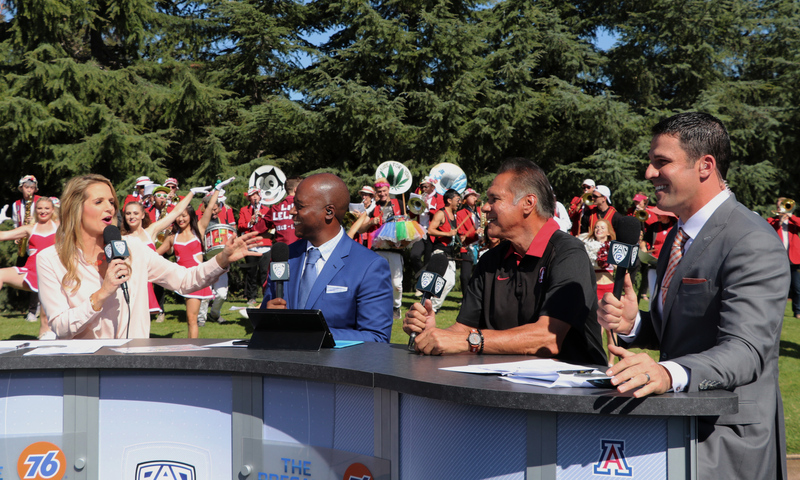 From left: Pac-12 Networks host Ashley Adamson, analyst Nigel Burton, special guest Jim Plunkett, and analyst Evan Moore were a part of the first episode of The Pregame, hosted on location at Stanford University last Saturday. The show moves to the campus of the University of Utah this Saturday and will visit all Pac-12 schools this fall. Of course, the key to good will with the schools is that the 12-week series will feature one stop at each campus throughout the fall. All the dates have been determined and tend to coincide with a major matchup, be it a rivalry game, a homecoming, or an intriguing matchup (like coach Chip Kelly’s return to Oregon on Nov. 3). According to Meyers, the strategy is to not have the show hosted from inside the stadium or even outside the stadium in some cases. The goal is to take viewers to campus sites that show off the feel of a college-football game day. The Pregame is a three-camera show (including a jib) that comprises simply a pop-up anchor desk, microphones, and one of P12N’s fiber-based IP production boxes. The ops team is able to use the network’s robust conference-wide IP network. Also, since, it’s not a full game, an onsite Sprinter van isn’t even needed to transmit the show: the entire show can be produced from one of the at-home control rooms in the conference’s home offices in San Francisco. The focus of the show is to better tell the stories of the conference’s schools. This isn’t a project where the team comes in on-Friday, sets up, and leaves on Saturday night. In fact, each Saturday’s show will serve as an anchor of a week that begins on Wednesday, when the first wave of short-form–content creators start shooting and packaging features to appear across P12N’s social and digital channels leading up to the weekend’s The Pregame show. P12N’s at-home efforts are also touching a pair of football games this season. Last Saturday’s Southern Utah at Oregon State game and this weekend’s matchup between Idaho State and Cal take place on busy production days for the network (more games than usual with out-of-conference matchups), and each campus offers enough bandwidth to pull off a six-camera show via the at-home model. Those shows will feature the six operated cameras with additional POVs using eight circuits inbound to P12N’s studios in San Francisco. The games will be supported by resources in San Francisco, including three Evertz DreamCatcher operations, as well as audio, graphics, and more. The on-air commentators will be at the stadium. As for the traditional, onsite truck productions for the rest of the football slate, Meyers says there’s little difference from last year’s top-flight shows. NEP is back again as the network’s primary truck vendor, and some aspects of the production, even with a truck, will still be handled in San Francisco using a “GREMI” model. This year, the ops team is looking to add the scorebug-operator position to the list of roles that do not need to be onsite, joining replay operators on the list.